Here's another for our upcoming show featuring paintings of Normandy. 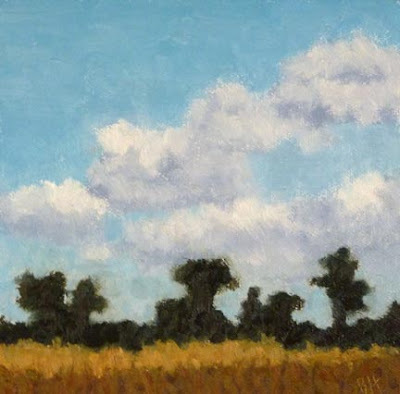 I'm pleased with what I learned about painting skys on our recent trip to Normandy with instructor Carolyn Walton. The trip was organized and run by Joelle Feldman. 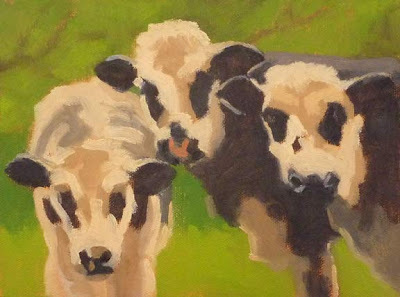 Take a look at Joelle's pastels for the show on her blog. They are beautiful. 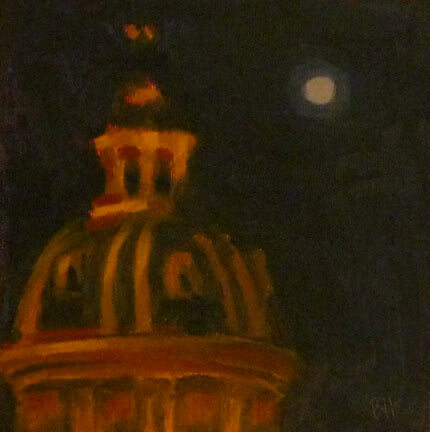 The temptation to name this one "Midnight in Paris" was strong, but it wasn't midnight when Mary and I were walking along the Seine near the pont des Arts and saw the beautiful lighted dome of the Institut de France. Once again, for our upcoming show. Wouldn't it have been fun to actually paint this as a nocturne, en plein air? It's really had to photograph something this dark, this is a little red despite my Photoshop magic. These guys are from a different farm than the previous pair, no brown spots, just black. Like our vanilla cows at the gite, they were marvelously curious, watching everything we did. And listenineg. They will go to the February show in Yarmouth as well. 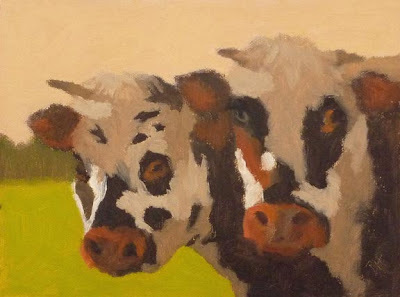 I was totally taken by the cows in Normandy. We had them right in our yard, though ours were solid cream color. These guys were really cute, I love the eye makeup. It's another for our upcoming show at the Yarmouth Frameshop and Gallery. I'm working on paintings for our February show inspired by last fall's visit to Normandy. 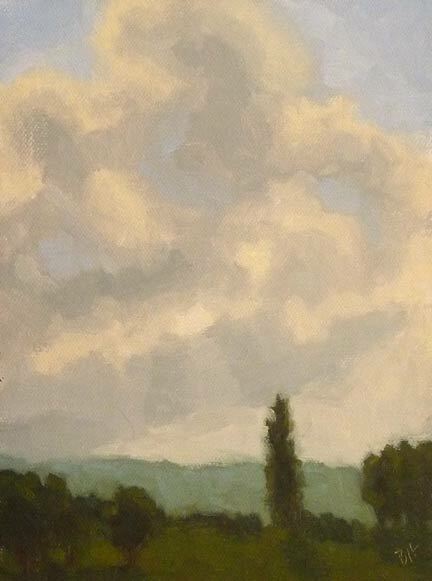 Two of the plein air paintings I did on the trip will be included (see them here and here). I enthusiastically attempted the scene above the night we arrived at our gite, but wiped it off in frustration. So here's a more thought out version, after a couple of sky painting lessons from Carolyn, done from a photo. More on the show in upcoming posts.